Broiler chickens have never been housed in cages – no animal advocacy organization has ever claimed that. What we have raised concerns about is the high rate of painful and crippling leg disorders caused by genetic selection for unnaturally fast growth, yet no assurances are provided on how this is being addressed. Broiler chickens have never been fed or injected with hormones. Being an animal, meat from chickens contains naturally-occurring hormones, but again, no animal advocacy organization has ever claimed that hormones or steroids are added. What we are concerned with is the lack of medication provided to suffering birds. No analgesics are provided when painful mutilations are carried out. For example, male broiler chickens who are destined for breeding barns may have parts of their toes cut or microwaved off, their beaks partially amputated, and sometimes even their combs cut off with regular household scissors, yet no standard of assurance has been provided that these suffering birds will be provided with any pain relief. Sadly, as reams of footage have proven, veterinarians employed in animal agriculture learn to turn a blind eye to animal suffering, so whether they are “monitoring” the industry or not makes little difference. As above, we’ve learned from undercover evidence that what those in animal agriculture understand as animal welfare is far from what you and I understand it as. 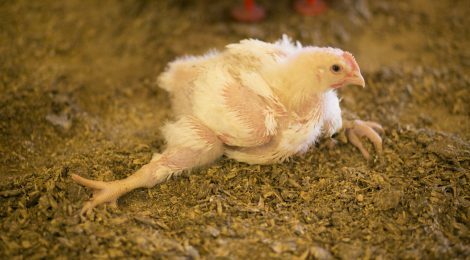 If the National Chicken Council doesn’t feel any urgency to change its breeding practices in an effort to reduce the rate of crippling leg disorders in birds and sees no need to provide even basic pain relief for brutal mutilations, their view of animal welfare is anything but reassuring. Rather than taking on the very real and very troubling issues plaguing the broiler chicken industry, the National Chicken Council has chosen to mislead the public with empty assurances in hopes of retaining sales while chickens continue to suffer. ← Ventilation Shutdown as a “Good Death”? !